Hybrid IT is a catalyst of progressive organizations. In fact, two-thirds of surveyed leaders say a blend of traditional and cloud infrastructure enables a strategic competitive advantage, according to a market study by the IBM Center for Applied Insights. That said, savvy leaders are using hybrid cloud to power their digital transformation agenda, going beyond cost reductions and productivity gains. They’re also using cloud as a foundation for next-generation initiatives -- such as the Internet of Things (IoT) and Cognitive Computing. According to findings from the latest Cisco Global Cloud Index (GCI), cloud service traffic is expected to rise 3.7-fold - that’s up from 3.9 zettabytes (ZB) per year in 2015 - to 14.1 ZB per year by 2020. The ongoing growth of cloud computing is being partly driven by the increased migration to hybrid cloud architectures that support the evolving demand for combining IT systems of record and systems of engagement. Cloud computing adopters are now able to achieve greater operational efficiencies, utilizing hyperscale IT infrastructure models. Therefore, additional analysis of IT application workloads on these cloud platforms was developed for this year's study. Business workloads will grow by 2.4 fold from 2015 to 2020, but their overall share of data center workloads will decrease from 79 to 72 percent. By 2020, database, analytics and IoT workloads will account for 22 percent of total business workloads -- that’s compared to 20 percent in 2015. Hyperscale data centers will grow from 259 in 2015 to 485 by 2020. Moreover, hyperscale data center traffic is projected to quintuple over the next five years. Hyperscale data center infrastructures will account for 47 percent of total data center installed servers and support 53 percent of all data center traffic by 2020. By 2020, cloud data center traffic will reach 14.1 ZB per year, up from 3.9 ZB per year in 2015. Note, a zettabyte is one trillion gigabytes. By 2020, traditional data center traffic will reach 1.3 ZB per year -- that’s up from 827 exabytes (EB) per year in 2015. By 2020, 92 percent of workloads will be processed by cloud data centers; 8 percent will be processed by traditional data centers. 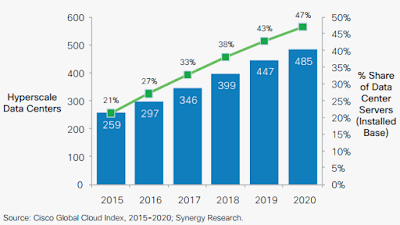 Workload density for cloud data centers was 7.3 in 2015 and will grow to 11.9 by 2020. Comparatively, for traditional data centers, workload density was 2.2 in 2015 and will grow modestly to 3.5 by 2020. By 2020, 68 percent (298 million) of the cloud workloads will be in public cloud data centers -- that’s up from 49 percent (66.3 million) in 2015 (35 percent CAGR 2015-2020). By 2020, 32 percent (142 million) of the cloud workloads will be in private cloud data centers -- that’s down from 51 percent (69.7 million) in 2015 (15 percent CAGR 2015-2020). By 2020, data center storage installed capacity will grow to 1.8 ZB - that’s up from 382 EB in 2015, or nearly a 5-fold growth. By 2020, the total global installed data storage capacity in cloud data centers will account for 88 percent share of total DC storage capacity - that’s up from 64.9 percent in 2015. Globally, the data stored in data centers will quintuple by 2020 to reach 915 EB by 2020 - that’s up 5.3-fold (a CAGR of 40 percent) from 171 EB in 2015. Big data will reach 247 EB by 2020, up almost 10-fold from 25 EB in 2015. Big data alone will represent 27 percent of data stored in data centers by 2020, up from 15 percent in 2015. Globally, data generated by IoT will reach 600 ZB per year by 2020 - that’s 275 times higher than projected traffic going from data centers to end users/devices (2.2 ZB); 39 times higher than total projected data center traffic (15.3 ZB). The Global Cloud Index (2015-2020) was developed by Cisco to estimate worldwide data center and cloud-based traffic growth trends. The ongoing forecast is particularly insightful, as the global networked economy and data center infrastructure become more intrinsically linked to commercial success.